Luke Wells produced an impressive all-round performance as Sussex Sharks got their Royal London One-Day Cup campaign off to a winning start against Kent at Hove. Playing only his seventh game in the competition and first for nearly two years, Wells took 2 for 30 with his leg spin as Kent were dismissed for 188. He then anchored Sussex’s response with 62 from 89 balls before skipper Ben Brown made an unbeaten 73 to lead his side to a seven-wicket win with 10.1 overs to spare, only their fifth in the competition since 2015. Kent hopes had been raised by two early breakthroughs. Luke Wright (4) nicked Mitch Claydon to slip and Harry Finch (9) was caught behind off Matt Henry to leave Sussex 19 for 2. Wells played watchfully at first before picking up the pace. He reached his maiden List A 50 with a drive down the ground for his seventh four and added more two boundaries before Henry returned to knock back his leg stump and end a stand of 107 in 22 overs with Brown. Brown passed 50 for the sixth time in List A cricket, his runs coming off 86 balls with six fours. Laurie Evans supported him with 38 not out in an unbroken fourth-wicket stand of 63 in 12.2 overs. Earlier, Kent won the toss but were dismissed with 6.3 overs unused and were about 40-50 runs under par on a pitch with few demons apart from occasional low bounce. That they got to 188 was largely down to opener Daniel Bell-Drummond who was last out for 90 from 115 balls, the fifth time he has passed 50 in his last nine innings in the competition. But apart from a stand of 85 in 13 overs with Alex Blake (29) for the fourth wicket Bell-Drummond never got the necessary support with no other Kent batsman getting into double figures. They were in trouble from the first ball of the second over when Ishant Sharma ripped one through skipper Joe Denly’s defences to knock out his middle and off stumps. Ollie Robinson picked up Zak Crawley and Heino Kuhn in an impressive opening spell to leave Kent 25 for 3 before Bell-Drummond and Blake rebuilt. Blake then played an unnecessarily risky reverse-sweep to fall leg-before in Wells’ first over for 29 and Kent wickets fell regularly after that. Left-arm spinner Danny Briggs bowled with impressive control in a spell of 3 for 25 which brought him the wickets of Adam Rouse (2), Darren Stevens (4) and Callum Haggett (8) and with Wells giving him excellent support, Sussex’s two slow bowlers had combined figures of 5 for 53 from 20 overs. Bell-Drummond hit Robinson for a straight six from a free hit early in his innings and six fours but missed out on a century when he sliced a drive to deep point off Sharma. 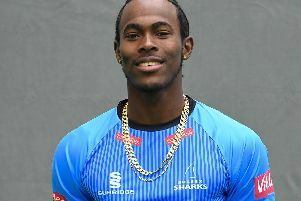 Sussex captain Brown said: "It was a very satisfying win. I thought it was a ruthless run chase after the victory was set up by a really disciplined performance from our bowlers. We took early wickets and then our spinners did an excellent job. Danny Briggs showed again what a canny, reliable bowler he is and I was delighted for Luke Wells. "He really wants to make a move in white-ball cricket and he showed what he can offer. He was a wicket-taking threat then batted really well after we lost a couple of early wickets. In the past I have batted at No7 so it's nice to be up the order and having the opportunity to get a proper score and on this occasion guide us to victory. It's a good start for us but we know Hampshire on Saturday will be a real test." Kent captain Denly said: "It wasn't one of our better days. It looked a good wicket but we seemed to be in a rush, there were a few soft dismissals. Daniel Bell-Drummond continued where he left off in this competition but we lost wickets too regularly and ended up being 50 or 60 runs short of par. "We had a chance but we needed something special from the bowlers and, to be fair, Luke Wells and Ben Brown batted nicely for them. We're not going to get carried away after one defeat but we need to improve on Sunday against Middlesex, who are a good one-day side."